Fall shows at Gallery In The Woods (145 Main St., Brattleboro) include prints by William H. Hays in Gallery 1 and new works by Edward A. Kingsbury III in Gallery 2. Though a full-time printmaker since 2007, William Hays has long had a strong presence in Brattleboro, where he owned The Artist's Loft Studio on Main Street and painted in oils and watercolors for nearly twenty-five years. Today he works quietly and more privately in his home a few blocks from town. Hays' prints are the product of much patience and craftsmanship. The complexity of his work is rarely seen in relief printing. This year alone, his prints have been featured in 16 juried or invitational national and international shows across the U.S. Hays is generously represented in the Gallery In The Woods showroom—he says it's the most complete presentation of his available linocut portfolio at any gallery in the country. 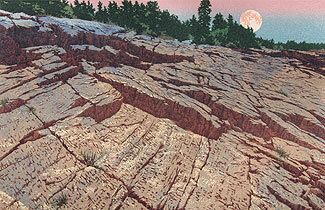 The artist will be at Gallery In The Woods during Gallery Walk to sign an edition of his latest print. Along with this new print, he will be showing for the first time a large collaborative woodcut recently completed with Matt Brown of Lyme, N.H. The two artists worked together for more than six months to complete the largest woodcut print either has done to date, entitled "Ascutney Afternoon." Ten impressions on each print were required to fulfill the collaborative vision of these two artists. The 27" x 20-1/2" print is a co mbination of traditional Japanese-style printing (Moku Hanga) and European-style printing with oil inks and an etching press. 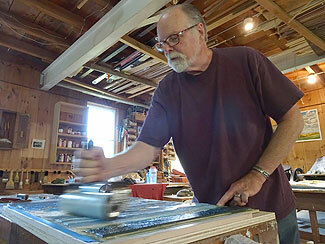 William Hays is applying ink to a block in preparation for printing. For Keene resident Ed Kingsbury, the act of making drawings has been a defining and healing force. 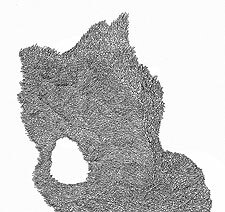 Catapulted by a painful and incurable illness overturning his life, he turned to prayer and constant meditative drawing in finepoint pen, transforming physical and emotional pain into a work of inspiration. The disciplined, rhythmic thread of unbroken lines moves in and out of suggested form, like a flock of birds catching wind, just beyond the rational, inviting our imagination to take flight. The scale of his drawings has increased as Kingsbury developed skill over the past decade. They elude definition of genre, displayed as Abstract Art at university galleries and museums, and as Outsider Art in venues in the U.S. and Europe. 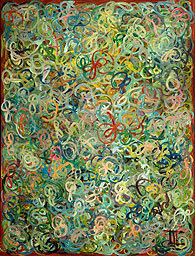 For this show, Ed presents his latest large-scale work, and some new exploration using color layering and brushwork. Stop by during Gallery Walk, 5:30 to 8:30, to meet the artists and enjoy live music by the Moondogs. Gallery In The Woods is otherwise open 7 days from 11 to 5:30.